Eugene Paul Wigner, born in Budapest, Hungary, on November 17, 1902, naturalized a citizen of the United States on January 8, 1937, has been since 1938 Thomas D. Jones Professor of Mathematical Physics at Princeton University – he retired in 1971. His formal education was acquired in Europe; he obtained the Dr. Ing. degree at the Technische Hochschule Berlin. Married in 1941 to Mary Annette Wheeler, he is the father of two children, David and Martha. His son, David, is teaching mathematics at the University of California in Berkeley. His daughter, Martha, is with the Chicago area transportation system, an organization endeavoring to improve the internal transportation system of that city. Dr.Wigner worked on the Manhattan Project at the University of Chicago during World War II, from 1942 to 1945, and in 1946-1947 became Director of Research and Development at Clinton Laboratories. Official recognition of his work in nuclear research includes the U. S. Medal for Merit, presented in 1946; the Enrico Fermi Prize (U.S.A.E.C.) awarded in 1958; and the Atoms for Peace Award, in 1960. Dr. Wigner holds the Medal of the Franklin Society, the Max Planck Medal of the German Physical Society, the George Washington Award of the American-Hungarian Studies Foundation (1964), the Semmelweis Medal of the American-Hungarian Medical Association (1965), and the National Medal of Science (1969). He has received honorary degrees from the University of Wisconsin, Washington University, Case Institute, University of Alberta ( Canada ), University of Chicago, Colby College, University of Pennsylvania, Yeshiva University, Thiel College, Notre Dame University, Technische Universität Berlin, Swarthmore College, Université de Louvain, Université de Liège, University of Illinois, Seton Hall, Catholic University and The Rockefeller University. He is a past vice- president and president of the American Physical Society, of which he remains a member. He is a past member of the board of directors of the American Nuclear Society and still a member; he holds memberships in the American Philosophical Society, the American Mathematical Society, the American Association of Physics Teachers, the National Academy of Science, the American Academy of Arts and Sciences, the Royal Netherlands Academy of Sciences and Letters, the American Association for the Advancement of Science, the Austrian Academy of Sciences, he is corresponding member of the Gesellschaft der Wissenschaften, Gottingen, and foreign member of the Royal Society of Great Britain. He was a member of the General Advisory Committee to the U.S. Atomic Energy Commission from 1952-1957, was reappointed to this committee in 1959 and served on it until 1964. 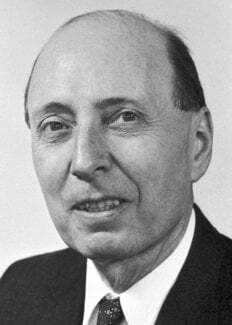 Eugene Wigner died on January 1, 1995.